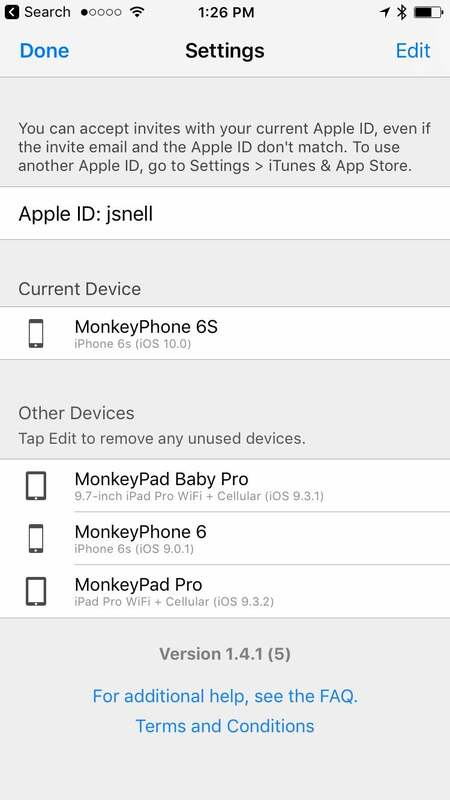 Besides your iCloud profile, Apple keeps lists of your associated devices in your Support Profile, Find My Friends, and even TestFlight. 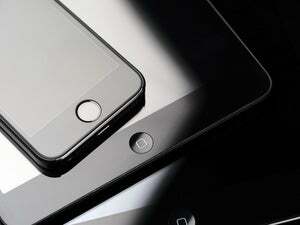 Back in July I wrote about some of the many lists Apple makes of the devices you own. I thought there were a few too many–that it was a bit too complicated to have various (differing) lists of Apple products in various locations. Well, I didn’t know the half of it. After I wrote the article, I heard from readers of a few other places to find some of the same lists, and some different lists, of your associated Apple devices. To recap: You can view your total iTunes authorizations in iTunes (Account > View my Account), and see a list of devices connected to iTunes in the Cloud by clicking the Manage Devices link on that screen. You can also go to appleid.apple.com and see a list of devices associated with your Apple ID, including their serial numbers. But that’s not all. 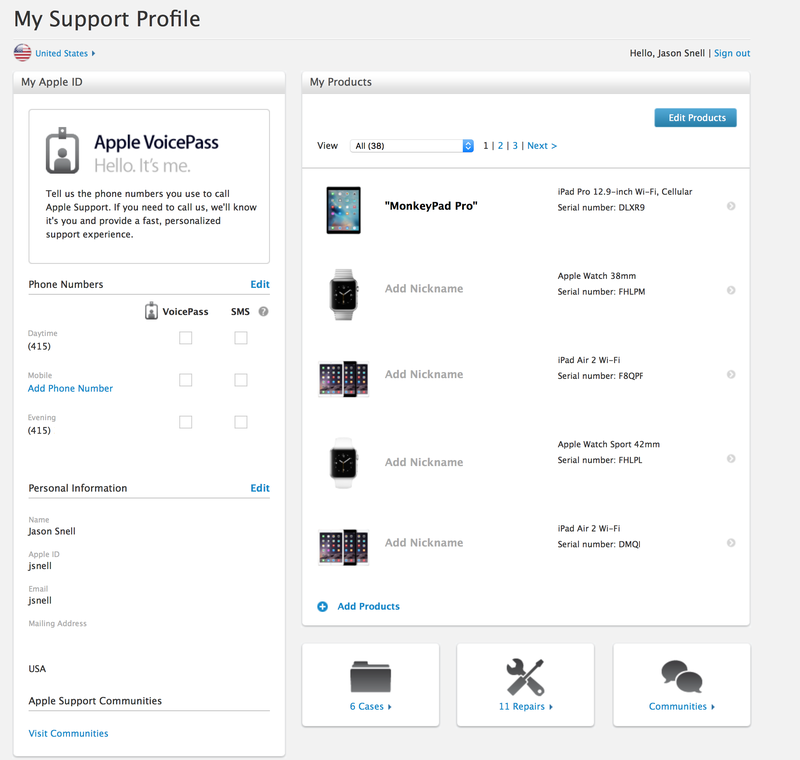 A page I didn’t mention is the Apple Support Profile, which has a much friendlier interface. Rather than being tied into your Apple ID, though, it appears to be connected to your Apple purchase history. My wife’s watch, which I bought (but is associated with her Apple ID) appears on my own Support Profile page. Some products I did buy from Apple, like my fourth-generation Apple TV, don’t show up at all. It’s hardly a canonical list. My Support Profile is also littered with old products that I don’t have anymore–hi there, original AirPort Base Station!–but unlike some of the other lists Apple provides, this page is quite customizable. It’s easy to remove products from the page, and you can also add products that don’t appear for whatever reason. From this page, you can also set a phone number to be your designated “VoicePass” number, meaning that Apple will be able to pull up your Apple support information automatically when you call an Apple support phone number. 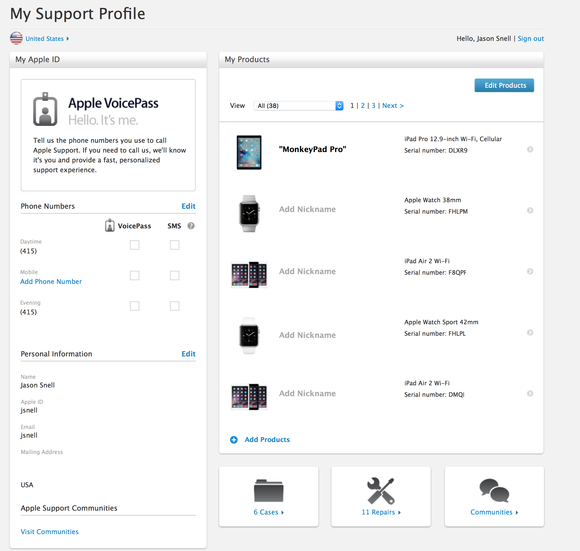 The Apple Support Profile page has a whole lot of stuff in it, and it’s worth knowing about. But it did a bad job of displaying all the devices currently associated with my Apple ID–it just doesn’t seem to have access to that data–and also offered a scattershot view into all the other Apple purchases I’ve made over the years. One list I failed to mention is perhaps the easiest way for anyone on an iOS device to get a list of their iCloud-associated devices, and it’s right inside the Settings app. 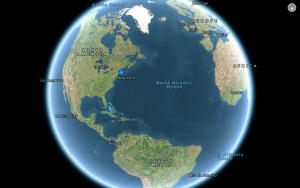 Tap iCloud, then your name and picture at the very top of the iCloud menu, and then tap Devices. 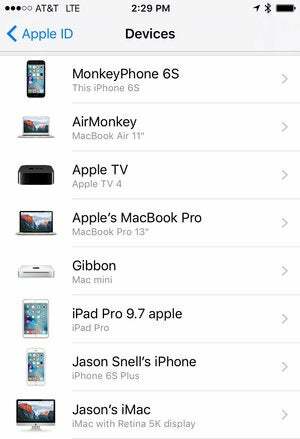 You’ll see a list of devices currently logged into to iCloud. Tap on any device to see more detailed information and get an option to remove it from your list. (If it’s still actively connected to iCloud, it will reappear automatically.) So far as I can tell, this is the same list that’s displayed on the Apple ID web page. I tried to install a beta version of an app using Apple’s TestFlight utility the other day, and was told that I had associated too many devices with my Apple ID! This isn’t an error that most people will see, but if you beta-test software you may run into it. I had to tap on my Apple ID at the bottom of the TestFlight app to open the app’s settings screen, which displays a list of devices that are attached to your Apple ID for TestFlight purposes. 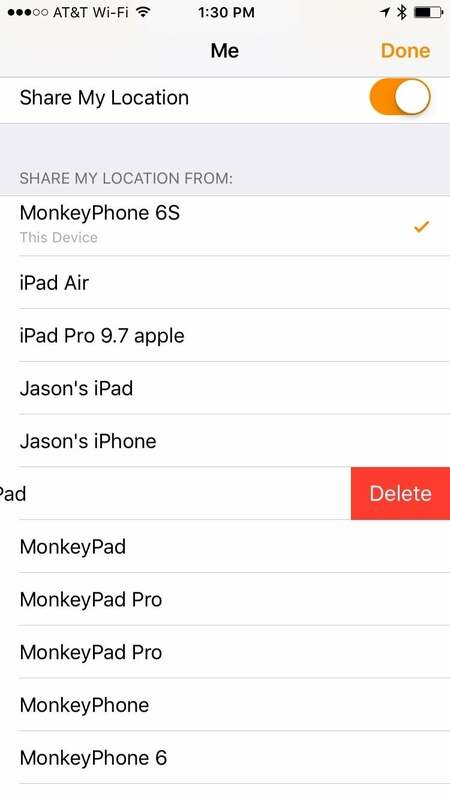 Fortunately, it’s easy to remove devices from this screen just by tapping the Edit button, selecting all my old devices, and deleting them. In Find My Friends, if you tap on your own name at the bottom of the screen, you’ll be given options about which device you’d like to use to share your location for your Apple ID. This appears to be an entirely different list of devices! In my case, many of the devices listed here (by name only) were old iPad minis I haven’t owned for ages. I have no idea where this list comes from, but you can delete items from this list by swiping from right to left and tapping on the Delete button. 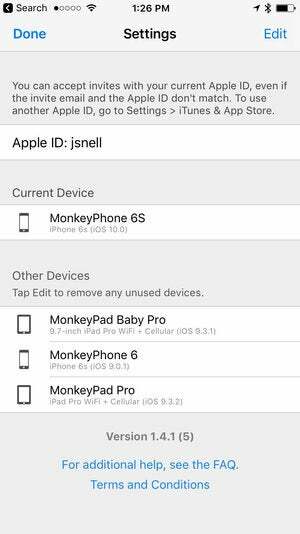 Between the Apple ID page and the iCloud area of the Settings app, it seems like Apple is slowly gathering its associated services and devices lists in one central location. There are a whole lot of outliers still remaining, but the direction seems positive. 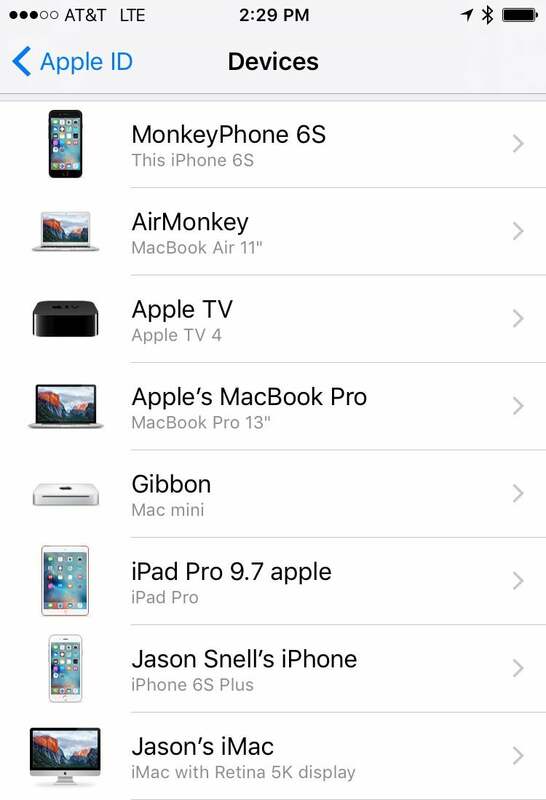 And the Apple Support Profile, while scattershot, can be made into a useful directory of every Apple product you own–if you put in a little work to curate it, adding devices here and deleting them there.